The Danish island of Bornholm is known for its four round churches built in the 12th and 13th centuries — four of only seven such churches in all of Denmark. Bornholm’s strategic location in the Baltic has made it vulnerable during the many conflicts that have occurred in the region over the centuries. The round churches were multipurpose structures that served as places of worship, storage facilities, and fortifications to guard against enemy attacks. Their thick walls and round shape helped them withstand battering rams, while their upper stories could only be accessed through narrow passages, providing a place of refuge for local people and their treasures. Freestanding belltowers were added several centuries after the original construction. All four churches are still used for religious services but are open to the public at other times. 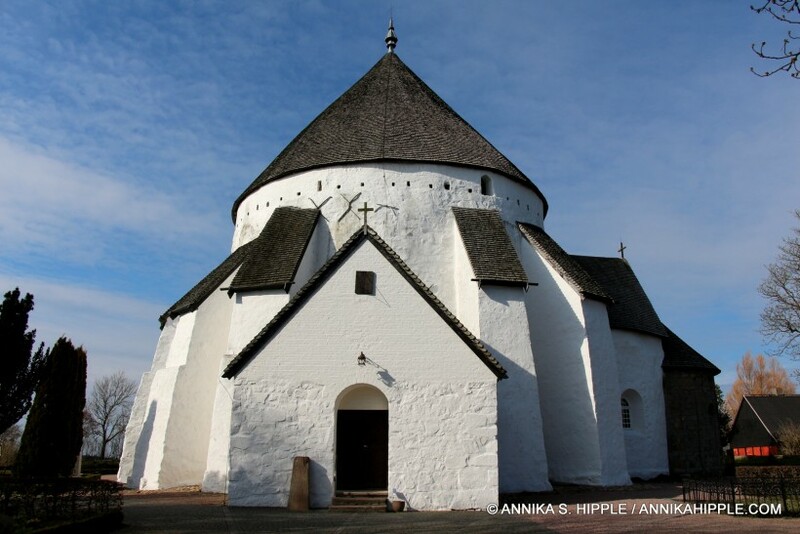 The largest and oldest of Bornholm’s round churches is Østerlars, dedicated to St. Laurentius (St. Lawrence) — “Lars” in Danish. It is traditionally believed to date from about 1150, though recent research suggests it may be slightly older, from the first half of the 12th century. Built in a Romanesque style, the church consists of a circular nave with walls that are two meters (6.5. feet) thick. The baptismal font stands inside the large, round, hollow central column, which is decorated with frescos from the mid-14th century. The outside buttresses were added in the 17th and 18th centuries, and the conical roof was added in 1744. The freestanding belltower dates from the 1600s. Above the religious space are two additional floors, reached through narrow passagways. The central level was likely the used for storage as well as for protection in times of danger, while the upper floor has small windows and arrow slits from which defenders could fire at attackers. Also on the grounds are three runestones, believed to date from the 11th century. Dedicated to St. Olaf (the beatified Norwegian King Olaf II, who was killed in battle in 1030), Ols Church was constructed around 1150. Like Østerlars, it consists of three stories, with the ground floor being used for religious purposes and the upper levels for storage and defense. The outside buttresses were added in the 19th century to protect the church from collapse. Frescos dating from various periods stretching back to the 1300s were uncovered during restoration work in the 20th century but are in poor condition. Nylars Church. Photo by 7alaskan via Wikimedia Commons. Used under a Creative Commons license. Built around 1165, Nylars is considered the best preserved of Bornholm’s round churches and has survived without the need for exterior buttresses. Like Østerlars and Ols, it has three stories used for religious functions, storage, and defense. Dedicated to St. Nicholas, the patron saint of seafarers, Nylars is known for its fine 13th century-frescos depicting the Creation and Adam and Eve in the Garden of Eden. The roof was added in the 17th century. Two runestones from the 11th century stand in the adjacent armory. 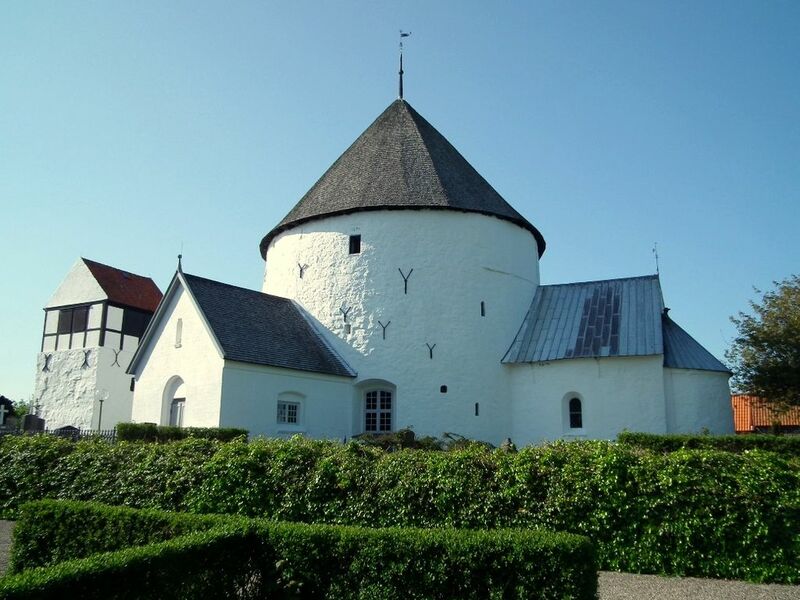 The smallest of Bornholm’s round churches, Ny Kirke (New Church) has just two stories. Located in the village of Nyker, it is generally believed to be the youngest of the four churches, built around the year 1200. Originally known as Ecclesia Omnium Sanctorum (All Saints Church), it received its present name in the 16th century. A series of 13 frescos depicting scenes from the Passion date from the second half of the 13th century. The chandelier in the choir is from 1594 but was restored in 1688.